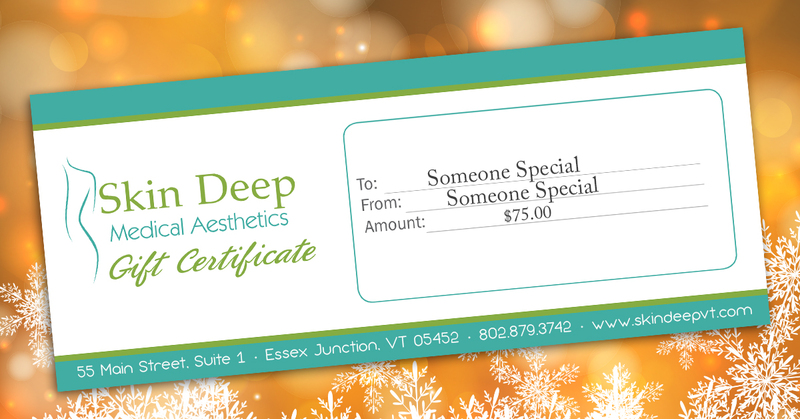 Skin Deep Medical Aesthetics has been brought to you by the physicians of Champlain OB/GYN. Because the physicians and staff at Champlain OB/GYN develop such strong, close relationships with our patients, patients feel very comfortable opening up to us about their concerns outside of the realm of typical gynecology care. In fact, we’ve had so many conversations about skin care, wrinkles, unwanted hair and veins and more that we decided to open Skin Deep. We feel this is a natural extension of our practice and will allow our patients to take care of their cosmetic concerns in a safe and comfortable environment. "Fabulous facials! Absolutely luxurious. " "Pure luxury. The professional facial was very relaxing in a beautiful environment. My skin looks fabulous. " "Julie has taught me so much about my skin, as an organ. She’s patiently helped me learn how to proactively plan for my overall skin health, so my skin glows w radiant health, rather than makeup. I am beautiful." Custom Designer Peel. "I just had the most relaxing and rejuvenating rose quartz facial with Julie S. The salon is lovely and Julie has a wonderful manner with with her clients. Highly recommend! " "Yes I will be back with Dr. Maria C[arracino] for further treatments! She was very thorough and I am very satisfied with her work! " "Enjoyed every moment of my appointment!! Maria C[arracino] was very professional and does a great job!!" "Please let Maria [Carracino] know that it [Botox] looks amazing! It has not been 24 hours and I can already tell a huge difference. Maria’s touch is light and gentle. She is kind, and extremely professional. I would highly recommend her. She is fantastic! " "Another [laser hair removal] appointment with Julie. Julie is professional, friendly, and always concerned about my comfort. I highly recommend her services." "She [Kara Flaherty] is patient and artistic. She took her time and explained everything that she was doing along the way. " "Maria [Carracino] was very personable and knowledgeable. I would not hesitate to recommend her. Great experience!" "[Julie] explained everything she was doing in detail. And also explained other procedures and cost as well as the steps they should be done in. Suggested some of the products you carry, but no hard sell. Very friendly and pleasant - and made me feel very comfortable"
"Love, love the outcome. Lorie and Dr. Kara [Flaherty] are informative and caring. I wouldn't go anywhere else. " "[Dr. Maria Carracino is] very very knowledgeable! I WILL definitely be back in May!" "I had a great experience with my first time injectables. Dr. Maria [Carracino] was very professional, explaining how the meds worked and exactly what I would feel and possible side effects. I will definitely return." "Dr. Flaherty was so helpful and generous with her time. She answered all my questions and made me feel at ease."